Upcycled furniture, VOC-free paint and sustainable tourism in Barcelona. Here is the last article about yök for TreeHugger. 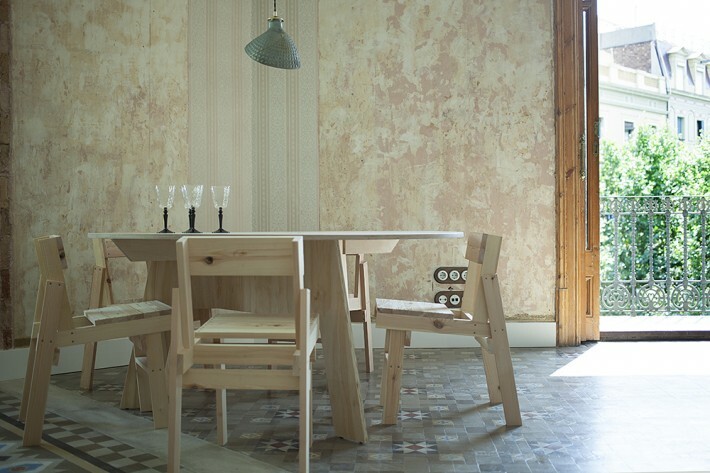 After having written about the VOC-free drywalls, tips on energy saving, the PVC-free piping, our reclaimed bathroom sinks, the natural wood fibre wall insulation, bathrooms and kitchens, beds, our office, and some of our furniture, I would like to mention a few more materials and actions we have taken at yök Casa + Cultura in Spain. Recyclability was always a key factor in choosing the materials, as well as proximity. The MOByök is a multifunctional piece specially designed for our hotel rooms. You can use it as a stool, table base, foot rest etc. but mainly it is meant to raise your suitcase to a comfortable height while living out of it. Together with designer Marcello Cannarsa we designed it, and fabricated it at the FabCafe inside the MOB co-working space around the corner from yök. 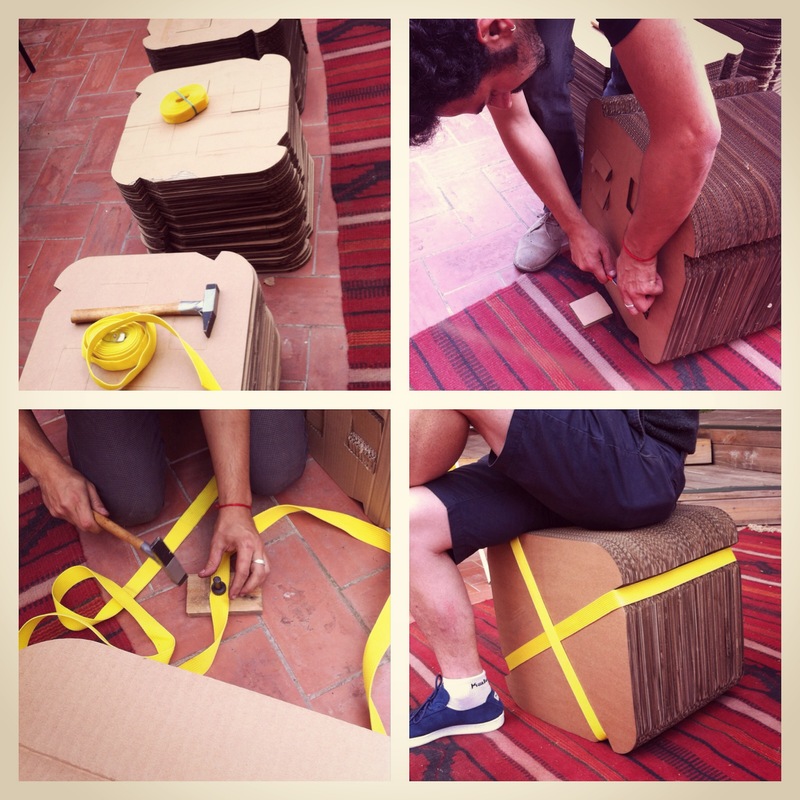 Marcello collected used cardboard boxes from businesses in the area, laser cut them and then assembled them using only a belt. By avoiding adding other materials such as glue, we made sure the whole thing can still be recycled after its (second) use. It wasn’t easy finding VOC-free paints that were also within our budget and worked well. 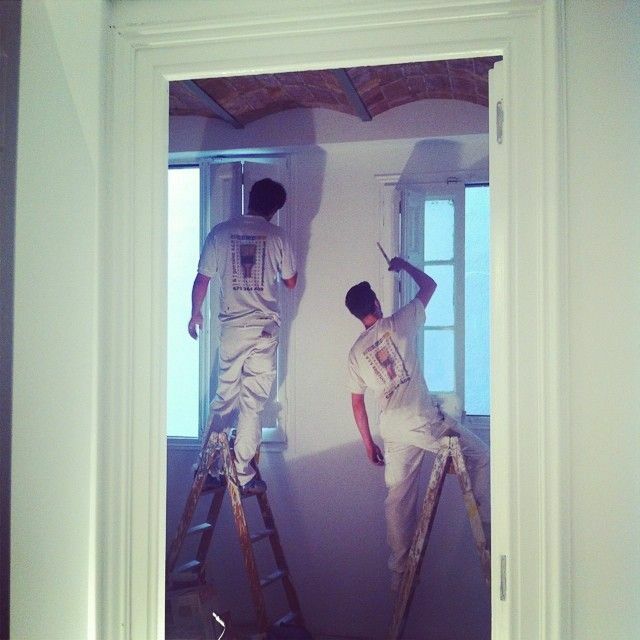 Sometimes with eco-paint you have to add more layers and it still doesn’t cover the wall perfectly. We managed to get VOC-free white walls thanks to CapaSilan by Caparol, whose VOC content is < 1 g/l. A few walls (like the one in the photo below) had a beautiful textured colour so we managed to preserve them as they were by sealing the pores with a natural latex. Last but not least, especially in a city affected by mass (bad) tourism and high air pollution, at yök we are challenged to come up with a sustainable way to do business without sacrificing the experience of our guests, both visitors and locals. The 3 Ps (People, Planet & Profit) are our guideline. We are by no means perfect, but we hope to set an example and a platform for better tourism in our city. Nothing sums it up better than our Manifesto. I would like to thank Treehugger and especially Lloyd Alter for the opportunity to document our eco-renovation here over the last 8 months since the first article and photos of the space before renovating in february. I received many encouraging emails, more questions and interesting comments from readers around the world. Please do not hesitate to contact me with any thoughts or to stay with us when you are in Barcelona next time.